No one starts a company with the assumption that will see a failed business. Such thinking only makes you more nervous than you already are. If the failure was heavily weighing on your mind, you would be unable to get anything done. You would constantly be consumed with the idea that you are a step away from failure. Let’s be realistic, 50% of small businesses fail within their first year of being in business. That is a very high rate of failure, even if it is not the 90% rate that some people like to throw around. What this means is that your new business has a 50% chance of survival. This can be good or bad depending on how you look at your odds. You probably see this as a great chance of your business surviving its first year. But, what if it doesn’t? This can be a hard pill to swallow. Experiencing a failed business is like dealing with a loss in the family. This is something that you poured your heart and soul into. You spent a lot of time and money on making sure that your endeavor works. Experiencing the devastating loss of failure makes you feel as if you have wasted so much of your time on something that did not produce any results. All you got for your efforts was a lot of frustration, loss of money (and probably debt you cannot afford), and being left to guess how you will start all over again. This is assuming that you actually want to start all over again. You may be seriously considering just getting a job so that you can earn a living like a normal person. At least you know that you will have a guaranteed paycheck and you will not have to constantly worry about how you will make your new business work. This will take a heavy load off of your shoulders and you will never have to worry about being labeled as a failure again. Do not give up so fast. Yes, your business failed. That does not mean that you are a failure. The successful entrepreneurs that inspired you to become an entrepreneur also had to deal with their own failures. The difference between you and them is that they looked at their failures as an opportunity to learn from their mistakes. This helped them improve their strategies and processes for the next business venture they would start. You on the other hand look at failure as the end of your business aspirations. This is the type of thinking that disqualifies you from being an entrepreneur in the first place. Real entrepreneurs understand that starting a business is a risk. What comes with risk is the potential to fail. If failure scares you away from being an entrepreneur, you were not meant to be one in the first place. 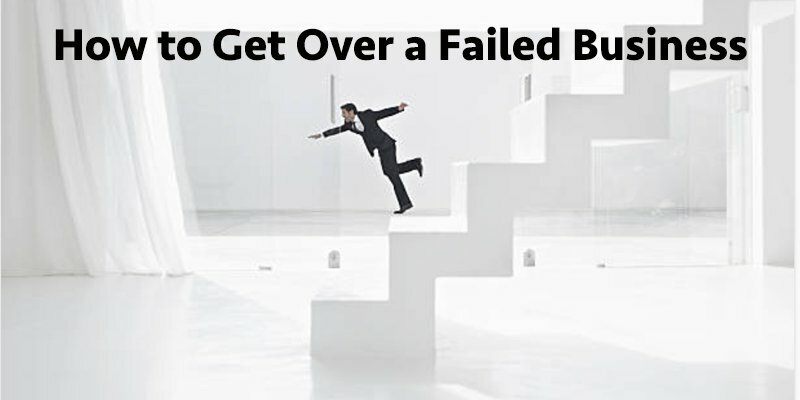 If you need to know how to get over your business failure, we can help you get back on track. The tips provided will teach you how to learn from your failed business so that you can create success your next go around. Continue reading to learn how. You need to learn where your mistakes were made and why they happened. Failure does not just occur due to chance. You were doing one or a few things that specifically led to your business underperforming. You need to examine every action that you took. Take a look at your strategy (if you had one) to see where planning did not meet execution and where you made the wrong assumptions even when planning did meet execution. You need to determine if your product or service was really an offer that your customers would have purchased because of the value it provided to them. Maybe you were spending too much money on the wrong marketing approach. Maybe you were not focused enough on making sales. Perhaps your financial projections were not conservative enough – your cash flow thus did not cover your actual expenses once you started your business. There can be various reasons for why your business failed. You need to find out what is the specific reason for your business failing and learn from that mistake. Your customers will provide you with honest feedback of what they thought about your business. They will let you know what you did that was great and what you did that was terrible. Although their brutal honesty can be hard to listen to, this is the real feedback you need if you want to ensure success for your next business venture. If you had just made listening to and acting upon this feedback a policy your first time in business, you probably could have saved your business. But it’s okay. Consider it a lesson learned from being an inexperienced business owner, which is a mistake you surely will not make the next time. You now know that satisfying your customers is crucial to your success. Which is why you will be sure to gather as much feedback from them as possible when your next business is operating. Learning from the failures of others is a great teacher. Learning how they rose above their failures to succeed is even better. Throughout history, many of the greatest leaders and innovators have experienced failure before eventual success. Business tycoons have lost great sums of money to only rebuild and create fortunes. You need to learn from both ends of the spectrum. You want to know what led to their mistakes. They are probably common mistakes that people still make today. You then want to learn how they rationalized their failures in order to pull lessons from their mistakes. Then you need to take note of how they turned their circumstances around by rebuilding, instead of giving up. This will help you think about your own situation – how it is not the end of the world after all. All you need to do is regroup and repurpose your strategy. You are probably dealing with a lot of stress due to the money you owe people, your own personal finances being wrecked, and people telling you how you made the wrong decision. Despite all this, you need to focus on creating your next success, rather than letting your failed business consume you. The more that you think about your failure, the more stressed you become. You have to just let it go and chalk it up as a lesson learned. Allowing yourself to get stressed out will only make you a nervous wreck who cannot get anything done. Relax, breathe, let go, and move forward. Instead of working in isolation, you need to surround yourself with people who understand the entrepreneur’s struggles and concerns. The average person knows nothing about owning and operating a business. Therefore, you cannot depend on your family and friends for advice on how to improve your business. They may live for the weekend, whereas you live for your business. This why you need to be in the company of people who have a complete understanding of what you go through as a business owner. These are people that you can seek advice from, help you pivot your business when you are stuck and provide you with the resources and connections that can help your business move forward. No one ever said that you are forced to go at it alone as an entrepreneur. You need to have other entrepreneurs in your corner who can support you through your ups and downs. This is the circle you need to be in if you aspire to create a successful business. After all, your network is your net worth. This does not necessarily mean going back to sit in a college classroom. You need to invest in hard skills that will help you operate a successful business One such investment is sales. If you hate selling or you are bad at selling, you will need to learn how to improve your sales technique. The same applies to marketing. These are core skills that you will need if you hope to gain attention for your business and acquire new customers. You may be saying that you can just hire experts in these fields. That is true but it never hurts to possess the ability to do these things yourself. This helps you to create the systems and processes that you can train your own staff on doing when you hand these duties off to them. At the very least, even if you do go on to hire experts, you will know how to monitor and guide them to achieve results on your own terms. It is now time to begin your next business venture. You may be nervous but do not let your anxiety hold you back. Remember that others who are wildly successful today have been in the same position that you are in – and most of them were nervous and anxious too. You can create a successful business if you have learned from your previous mistakes. Just move forward and give it your best effort. You have nothing to lose when you only have one life to live. Let Rikvin accompany you on your next business journey. With twenty years of know-how in company incorporation, accounting, tax, payroll and immigration services, you can count on us to be your dedicated one-stop business solution.